- Slimey lands on the moon. - Sloppy is born in Oscar's taxi. - Elmo conquers his fear of clowns. 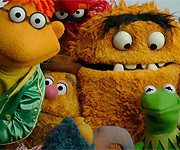 - Big Bird is frustrated because he wasn't picked to be the Alligator King in Celina's dance class, but he ultimately switches roles with Gabi, and everyone is happy. - Telly tries to blow bubbles and fails, but finds that he can make bubbles by waving the wand rather than blowing into it. One episode I've been reminiscing about as of late is from Season 33, where there was a yard sale held in the arbor, and Telly keeps debating on whether or not he should sell his beloved stuffed horse Clark, because on the one hand, he's "too old" to keep him anymore, but on the other hand, it just can't bear to part with him because he means too much to him. I almost forgot about how they redid the carriage house that season with all the animal murals and everything... probably to show that it was Gina's vet office... but then, they changed it right back like a couple of seasons later, so that was kinda a pointless paint job, I guess. I would say 3999 because I liked how Zoe and Ernie interacted with each other in the street scene together. Were these made in "response" to 9/11? It's weird, I remember these episodes more than I remember that. Now I'm not technically talking about an episode more of a sketch and an episode. The firefly episode was fantastic and had a great plot with Telly and Baby Bear. 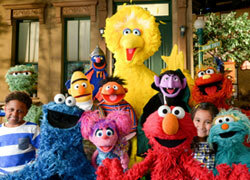 But the parody sketch in it, "Pre-School Musical" is my altime favorite sketch/parody/song/thing on Sesame Street ever! Love it! I never mentioned those episodes, because I had taped them, so they didn't quite stick with me the way other episodes have that I've mentioned, but those were memorable, weren't they? No... they were produced in November of 2000, and aired in March of 2001. HOWEVER, the Hooper's Store fire episode WAS a response to 9/11. -Maria and Luis have decide that it's time that Gabi's bike had its training wheels removed. Both parents are excited taking that their daughter is becoming a big girl. Unknown to Maria and Luis, however, Gabi is secretly not too thrilled about it. -The letter X shows up sad and is considering leaving the alphabet because it feels that it isn't an important letter. Telly and a few others try to cheer the letter up and encourage it to stay, by proving that the letter X is in fact needed. -There was also an episode with Oscar hosting some sort of television show, and doing a social experiment on Baby Bear and Goldilocks. It focused on why the two were unhappy about how the story of "Goldilocks and the Three Bears" ended. Near the end of the episode, it turns out that Goldilocks was unhappy obviously that she was scared away, and Baby Bear was also unhappy because Goldilocks left without an apology. (Don't know for sure which season it was shown). If there are any episodes that you still remember, you can post them here. Sorry if this has already been done before. Thanks. Big Bird and Snuffy were having a scavenger hunt, and Zoe wanted to play too, but they weren't so sure, because the object of the hunt was to find the biggest things on the street they could find, and they didn't think someone so small like her would be good at finding big things. However, they soon feel jealous, because not only is Zoe finding big things, the things she's finding (like a bus, the driver I believe was Pam Arciero) that are even bigger than what they're finding, which makes them not want to play with her anymore, because they don't think it's right for a little person like her to find bigger things than them, when they should be experts on big. The Sesame Street episode that has always stuck with me, and to this day I have no clue why, is the one that takes place on the stairs. I don't really remember the context of it... I just remember Big Bird is sitting on the steps for an entire day and then everyone sings a song called "If These Steps Could Talk" (I *think* that's what it's called). After all of these years I still remember chunks of the song, namely Gorden's verses. An episode that stuck with me really well was the one where Telly breaks his arm. He's runnin around with someone and runs into some girl's parked bike. I want to say that either that episode was a part of a series or they kept continuity with it because I remember an episode where Telly asks if the cast can come off and the doctor tells him three more weeks. There was also an episode where they were talking about tringles and some lady stamped his cast with a triangle. I also loved the series where Oscar's Worm goes into space. I remember my sisters and I were so excited about it we all made extra sure with our mom that if we had to run errands that day (I think it was spring or summer break) that we had to be home in time to watch Sesame Street. Does Big Bird and the Dodo Birds count as an episode? I know it's a technically movie but I really liked it. I liked it so much that I checked out the book written with it so many times from the school library when I was younger. YES. When that first started happening for my brother and I, we would always turn on the TV after school and wait to see if Wormy (was that his name?) had made it to the moon or if he was on his way back! I remember that being so exciting! I am ashamed of you people for forgetting that Oscar's worm's name is Slimey. I am ashamed. Sorry Thanks for the reminder. I... got the "y" at the end of the name. I pride myself in that much. And, to be fair, I have not watched Sesame Street in over ten years. I have a few plots that stick out in my mind from the 1980's. Luis & Maria's wedding was so romantic, getting married on the rooftop (too bad I couldn't find the streets scenes on YouTube so I could watch it again). Gaby's birth was funny because Oscar could be nice sometimes (I was still watching even when I was almost 10). Mr. Hooper's death was another one that stuck out. Miles' adoption, I remember watching this when it originally aired (I think I was in kindergarten) and was so excited to see a new baby on the street. I did catch some newer episodes on Sesame's official website and the Hurricane episodes were well done in my opinion. I'm glad they have the hurricane episodes on their site... because my tape is about eaten up, lol. Suddenly, I'm remembering a couple of babysitting related episodes, I believe both are from Season 31 (I don't know, the latter may actually be 32, I'd have to look at Muppet Wiki). The first of which I seem to recall involving Big Bird was wanting to have a playdate with Maria, but she was too busy having to suddenly babysit a baby bird, which makes Big Bird jealous because Maria's giving more attention to the baby bird than him, but he suddenly feels useful when she asks him for help when it comes to grooming the baby bird. The second of which is also Maria babysitting, this time she and Gabi are babysitting Natasha, and Natasha keeps crying out "Hoongie", which Maria and Gabi can't seem to understand what she means, thinking she means things like she's hungry and such; finally towards the end of the story, Ingrid returns and reveals "Hoongie" is her favorite dolly that they forgot to leave with her. I always remember an episode where Big Bird goes to the grown up's party but is annoyed that there's no games or party favors so he leaves in a huff, lol. I don't remember that one, but I can sort of sympathize with that... I seem to recall when I was maybe nine or so, my parents, for some reason, had a small party at our house with some of their friends from church and such, they had a few different games set up, and there was one that looked interesting, and I wanted to sit in and learn how to play, but I since I didn't know how to play to begin with, I had to be shooed away. Oh well, years later, I learned how to play Uno the first time I played, specifically the "vicious" version of the game... and won... first time... and since then, Uno's kind of been my game, lol. My epsiode is when Oscar ate some rotten cookies and turned into a Hansome Prince.